This allows you to go look for a simple, delicious recipe here that sounds good to you and your family. If you want something with chicken, pasta, even vegetarian, whatever you want to eat, you can find it here. Just choose the recipe and make it to your particular taste. This allows you to know what ingredients are going into what you are eating. You may need help if you have MS or you might even get help from kids if the recipe sounds good to them too My middle school son even likes to make pasta-based, Italian-type foods “himself” (with a little help)! Expect some cheese snitching if the recipe calls for it, though. An easy low fat dessert can be added for your sweet tooth. You can make the meal to your diet. It might even be a little fun for everyone to do something different together. Communication can start here and carry over to the meal! You can find recipes in lots of places if you just look. Food labels, like soup, cheese, tortilla packages, stuffing boxes, pasta packages,and instant rice to name a few. The ones listed below are a few I use the most. I can even make cookbooks on those sites for future use. This is a website that I get several recipes from by getting added to their email list. There are several meat and potato recipes I use from here. As a hard farm worker, my husband gets meat and potatoes at many noon meals. I’m always looking for new recipes here. This website I also get emails from by getting added to their email list. They have food from any course. One pot comfort foods, slow cooker dishes, holiday and entertaining, a how-to section, everyday meals, and just recipes. I find that some of their recipes start out with a boxed dinner, add some ingredients and make it just a little more homemade tasting. From the recipes that I have used off their website, most are made with food I have in my pantry or freezer. That makes the recipes have familiar ingredients, not exotic and hard to find (expensive) ingredients. I also have a cookbook on this site to get recipes from a little quicker. 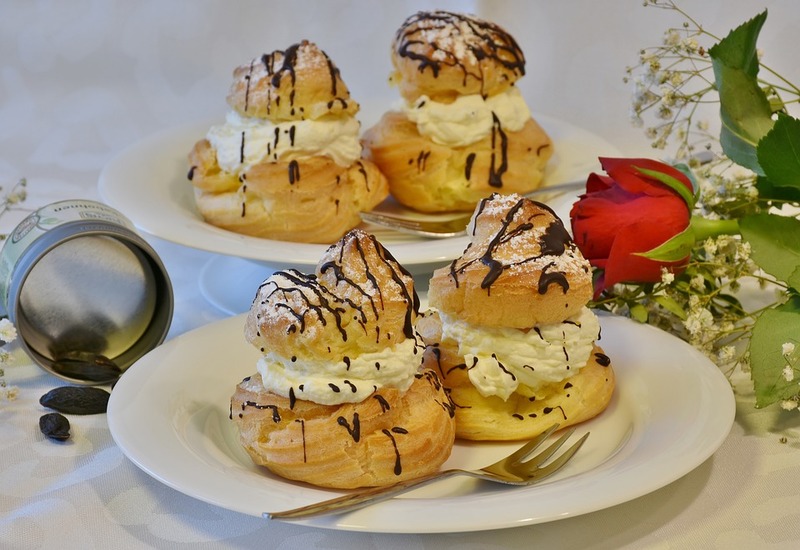 My family’s favorite recipe that comes to mind quickly is for dessert cream puffs. I only make these for special occasions because the recipe requires several eggs. I double the cream puff pastry recipe, but I make 1/2 a batch of the chocolate filling for half the pastries and use an already-made Bavarian creme filling for the other half of the pastries. I can’t have chocolate (yes I’ve gotten used to it! ), so since I’ve gone to the trouble to make them, I make some I can eat, too. Chocolate can be drizzled over the top for more chocolate taste, I mean to make it look fancier. You can also make the pastries in a 2″ oblong shape, fill with bavarian creme,and put chocolate frosting on top of the top pastry for eclairs. For yet another choice, pastries can also be filled with chicken salad, or the like, and eat them for a meal or party, etc. No matter what you fill the pastries with, you need to make sure you have room in the refrigerator to store them. I will tell you this is a time-consuming recipe. You have time to rest, while the pastries bake, waiting for them to cool, and them once they are put away in the refrigerator. With resting time, the process is worth it when you have a bite! You can make the pastries to your size preference, just adjust the cooking time. I’ve also bought a pan from here. I broke the lid of my jellyroll pan and this was the ONLY place I found that pan and lid to replace it reasonably priced. I think it is a 11″ x 15″ size? A jellyroll pan is used for several of my older recipes from relatives. All I could late find lately were half sheet or quarter sheet pans. I guess that’s the new size?